Capitol Hill’s Cesar Chavez Charter School at 709 12th Street is closing in June. You’ve heard that. But you probably don’t know that the building is a contributing building in the Capitol Hill Historic District – changes require Historic Preservation Board approval. 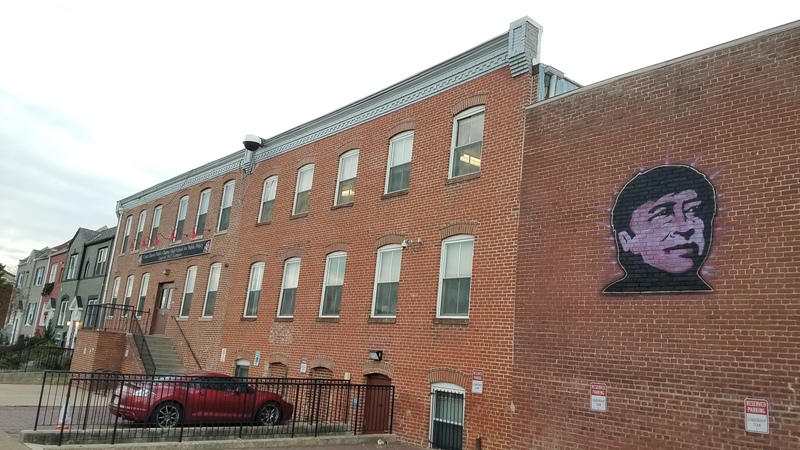 The building used to be a furniture warehouse for the Hachman Furniture Company whose retail outlet was the 1882 Haines Building at 8th and Pennsylvania Avenue, SE. The Haines Building was bought by Community Connections in 1984. The building’s retail space facing 8th Street was subsequently occupied by Foot Locker, followed by Dunkin Donuts and Baskin-Robbins. DDOT Notice of Intent re Installation of Traffic Signal at Maine Ave and I-395 Terminus – Brook Hailemariam. DC Fire and EMS Right Care Right Now – Doug Buchanan. Pepco/Capitol Grid Project Update – Travoris Culpepper. DC United/CBCC Update – Rikki Kramer. Petalpalooza at the Wharf – Ashley Depew. Alcohol Beverage License Renewals – Preliminary recommendations RE March renewals: SMDs 01, 02, 04 (Boats + others), 05 has only Levy/DC United CX. JBG Smith Half Street Digital Signage. Tishman Speyer/88 K Street Letter to DDOT RE Proposed Road Closures. Letter to DDOT RE Bus Stop and Removal of Parking Space at 4th Street, and M Street SW.
Wharf Phase II Construction Update. Update on Construction at Sutton Square at The Wharf. Letter of Support RE Southwest Library Funding. Letter to DCHA RE Greenleaf RFP. ANC6B will meet at 7:00pm at Hill Center, 921 Pennsylvania Avenue, SE. Ward 6 Councilmember Charles Allen. Update on Ward 6. 700 Wine, LLC. t/a The Eastern; 700 Pennsylvania Ave SE; New Retailer’s Class “C” Tavern License operating as a wine bar and serving a limited food menu. Sidewalk Café with 30 seats. Total Occupancy Load is 85 with seating inside for 55. Hours of Operation and Consumption Inside Premise and On Sidewalk Café: Sunday through Thursday 9am-2am. Friday and Saturday 9am-3am. Historic Landmark Nomination: Southeast Branch Library, 403 7th Street,SE – Nominated by Capitol Hill Restoration Society. 411 4th Street, SE – Historic Preservation Application – Concept/two-story rear addition. 1322 D Street SE – Zoning Adjustment Application – Special exception to construct a two-story, rear addition to an existing, attached principle dwelling unit. Report on compilation of Suggested Locations in 6B for Dockless Bike Racks. Report on effort to add the unit block of 15th Street, SE to the RPP system. Reestablishment of ANC 6B Task forces – Hill East Task Force and Constituent Services Task Force. Election of Chairpersons for standing committees & task forces. Appointment of ANC 6B representative to Eastern Market Metro Plaza Action Taskforce. Election of ANC 6B representative to Eastern Market Community Advisory Committee. Appointment of Resident Members to Committees & Task Forces. ANC6C meets at 7:00pm at the Heritage Foundation, 214 Massachusetts Avenue, NE. Snow removal program, Celeste Duffie, DPW. DC Consumer Utility Board — Gene Imhoff, Ward 6 representative. 224 C Street, NE, Historic Preservation Application — Revised application for concept approval, second-story garage addition. 918 7th Street, NE, Zoning Adjustment application —Special exceptions to construct a third-story addition. 209 M Street, NE/Uline Arena, Zoning Adjustment application – Special exception to permit live performances at the VBR Brewing Corporation, an eating and drinking establishment. Letter to the Zoning Commission on adequate time window for comments on future PUD Modifications. Florida Ave corridor (New York and Florida Avenue intersection) — Update. 2nd Street NE—DDOT request to study corridor from Massachusetts Avenue to M Street, NE. 668 E Street, NE, Public Space application for a permit for driveway and paving. K Street, NE road diet—Removal of rush-hour parking and addition of bicycle lanes. ANC6A meets at 7:00pm, Miner Elementary School, 601 15th Street, NE. MPD 1D – Captain Michael Pulliam. Ward 6 State Board of Education Representative – Jessica Sutter. H Street Fresh Farms Market – Carrie Hildebrandt, Community Engagement Manager. Right Care Right Now – Amy Mauro, DC Fire and Emergency Management Services. Recommendation: ANC6A provisionally approve the Ludlow-Taylor Parent Teacher Organization (LTES PTO) grant application for $2,930 for the Fountas and Pinnell Leveled Literacy Intervention (LLI) Red Bundle pending resolution of the negative opinion from the Office of the Advisory Neighborhood Commission (OANC) regarding grant making by ANCs. Letter of support to DDOT for the reinstatement of expired construction permit for Chick-Fil-A, 1401 Maryland Avenue, NE. Letter of support to BZA for a special exception under the inclusionary zoning lot dimension subdivide the existing lot and construct three (3) new, attached flats at 1511 – 1515 A Street, NE, on the conditions that the developer make best efforts to obtain letters of support from neighbors at 1507, 1509, and 1515 A Street NE; revise the final design to include consistent massing with design of the cornices; that the developer conduct a shadow study; and that the current owner withdraws the appeal currently pending before the Office of Administrative Hearings related to prior zoning of the property. Letter of support to Commun-ET LLC for after-hours permit applications that would allow the Maury Elementary construction team to make up lost time due to weather delays. The team is requesting to work on Sundays from 7:00 am -7:00 pm from February 17 to March 31, 2019.